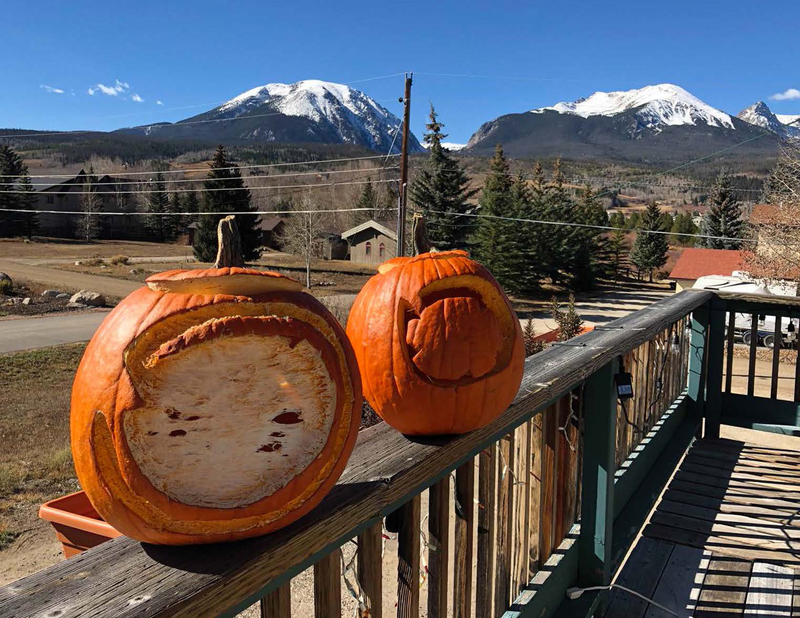 Happy Halloween from us at The Pad – our first attempts at carving pumpkins with our logo left much to be desired – perhaps we’ll find some talent at next year’s pumpkin carving party!! While Halloween is a fun holiday…eating candy, dressing up, parties – it’s always good to know the origins. Below we’ve posted an article from The Examiner with some trivia and history. Thankful for the Irish immigrants who found that pumpkins were easier to carve than potatoes…we love the pumpkin seeds and soup we get to enjoy after the carving! Halloween, celebrated on Oct. 31, originally started as nothing more than an autumn harvest festival. Today, the holiday is associated with ghosts, costumes and, of course, candy. It has long been thought that Halloween is the one day of the year the dead can return to earth. It is estimated that Americans spend more than $6 billion each year on Halloween, which makes it the United States’ second largest commercial holiday. Pumpkins are actually indigenous to the Western Hemisphere and have been found on the continent for more than 5,000 years. Pumpkins can be orange, white or yellow. Pumpkins entered into the Halloween celebration after Irish immigrants came to America and found that pumpkins were easier to carve than potatoes for the holiday. Jack-’o-lanterns have been around for hundreds of years. The legend is of a man named Jack. According to the History Channel’s website, www.history.com, Jack invited the devil for a drink. Jack did not want to pay for his drink, so he made a deal with the devil. The devil turned himself into coins, but instead of paying for the drink, Jack kept the coins. Later freeing the devil, he promised to change him back if he did not steal his soul. Upon his own death, God would not let Jack into heaven because of his past and the devil would not let him into hell. Instead, the devil gave Jack a piece of coal, which Jack placed into a turnip. The legend goes that Jack used the turnip and coal to light his way as he looked for a final resting place. The original jack-’o-lanterns in Ireland were carved out of turnips or potatoes. The idea of people gathering together to celebrate dates back to the early American settlers who celebrated the harvest. People would gather at these events and would share ghost stories, dance, sing and tell fortunes. Since that time, Halloween has become more of a holiday about bobbing for apples and candy than celebrating the harvest. Halloween is mix of traditions from Celtic, Catholic and Roman religious rituals. Celts would dress in costumes and light bonfires to ward of ghosts, thought to return on Halloween. The Celts believe that the boundaries between the living and the dead blurred on Halloween, making it easier for ghosts and spirits to return to cause mischief. More than 35 million pounds of candy corn is produced each year according to the National Confectioner’s Association. Created in the late 1800s, the three colors are supposed to look like the colors in kernels of corn. A popular staple at Halloween, candy corn is actually available throughout the year with some companies making other versions of the candy for different holidays. Ghost stories are common throughout the year, but especially on Halloween. Most cultures and civilization contain some sort of stories about spirits, many of whom return from the dead to haunt people and places. According the History Channel Web site, ghosts are “specters” and belief is based on the thought that a person’s spirit lives on after their death. Places or structures that are haunted by ghosts are thought to have some sort of connection to the ghost’s past. Signs of a haunting include noises, odors, breezes and displaced objects. Costumes were first worn to tell each other’s fortunes and for protection against evil spirits. The first costumes in Ireland were made of animal heads and skins. The modern celebration of Halloween still involves costumes, but many are not as creepy or scary as the first. Costumes now include everything from superheroes and villains to princesses and furry animals. The word witch comes from the word “wica,” an Old Saxon word that means “wise one” according to the National Confectioners Association. The early-known witches were dealers in medicinal herbs and charms and respected in their own communities. But superstitions were created and told of witches casting spells and making trouble for others. Settlers who arrived in America brought with them these superstitions, and coupled with the Native American belief in witches, the legend grew. Trick-or-treating for candy and prizes is a common tradition in the United States. A predecessor of trick-or-treating is a Scottish and Irish practice called “Guising,” where children went from door to door in costumes collecting coins and food. Children would only receive the prize if they did a “trick” such as song or dance, before the treat was given. One quarter of all of the candy sold in the United States every year is purchased specifically for Halloween. According to the National Confectioner’s Association, a majority of all candy given out on Halloween is chocolate. Three out of every 10 individuals will pass out lollipops or other hard candy.